KINGS. (DVD Artwork). ©Lionsgate Entertainment. The powerful drama “Kings” arrives on DVD Tuesday July 31 from Lionsgate. Starring Academy Award winner Halle Berry (“Monster’s Ball”) and James Bond franchise-star Daniel Craig, the film tells the tale of a foster mother (Berry) who looks to her eccentric neighbor (Craig) to keep her family safe during the Rodney King riots in 1992. Debuting 25 years after the tragic events unfolded in Los Angeles, and written and directed by award-winning director Deniz Gamze Erguven (“Mustang”), “Kings” will be available for the suggested retail price of $19.98. Acorn TV features the DVD and Blu-ray debut of the hit Canadian period mystery “Murdoch Mysteries, Series 11” (a.k.a. “The Artful Detective”) on Tuesday July 31. Garnering more than two dozen Gemini nominations, “Murdoch Mysteries” has found a huge audience for its period charm, entertaining mysteries, and likeable characters. Set in Toronto in the late 1890s and early 1900s during the age of invention, the mystery series centers on Detective William Murdoch (Yannick Bisson), a methodical and dashing detective, who enlists radical new forensic techniques like fingerprinting, ultraviolet light, and trace evidence to solve some of the city’s most gruesome murders. In Series 11, Detective William Murdoch and his friends face new challenges as the award-winning Canadian mystery returns. With Murdoch languishing in jail for murder, Constable Crabtree (Jonny Harris, Still Standing), Inspector Brackenreid (Thomas Craig, “Coronation Street”), and Detective Watts (Daniel Maslany, “Goliath”) race to prove his innocence, while Dr. Julia Ogden (Gemini winner Helene Joy, “Durham County”) remains in hiding from the corrupt forces that have taken over Station House No. 4. When the dust settles, Murdoch and his team solve cases featuring poisoned wine, high-speed transportation, botched organ transplants, and anti-Semitic riots, along the way encountering historical figures like Helen Keller, Alexander Graham Bell, and Theodore Roosevelt. Guest stars include Tamzin Outhwaite (“New Tricks”), Colin Mochrie (“Whose Line Is It Anyway?”), Peter Keleghan (“Workin’ Moms”), David Hewlett (“The Shape of Water”) and WWE “Raw” and “Smackdown!” star Jay “Christian” Reso. The five-disc DVD and four-disc Blu-ray sets feature 18 episodes and a bonus “Making Murdoch” featurette ($59.99, Amazon.com). 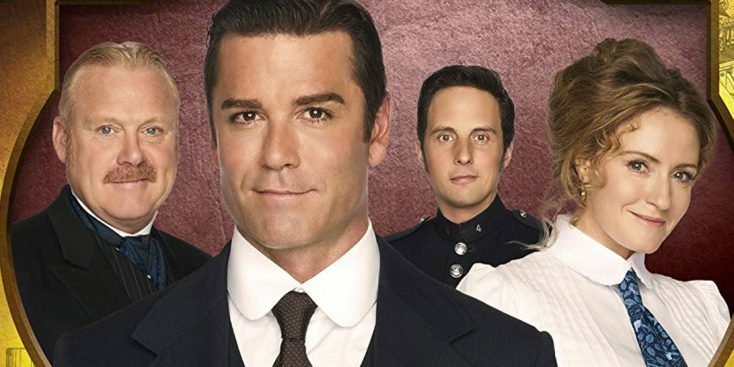 “Murdoch Mysteries, Series 11” made its U.S. premiere in December on Acorn TV. The popular series been renewed for a 12th season. Acorn TV is North America’s most popular streaming service focused on British and international television from RLJ Entertainment. ‘Annihilation,’ ‘Jackass,’ ‘Peter Pan’ Signature Collection Edition, More on Home Entertainment … Plus Giveaways!! !